The holiday season is back at Knott’s Berry Farm, which transforms into Knott’s Merry Farm from Nov. 17 through Jan. 7, 2018. Guests can enjoy the sights and sounds of the season, as well as classic shows, like “Merry Christmas, Snoopy!,” the festive ice show; or stroll through the streets of Calico for seasonal treats that can’t be found elsewhere; live Christmas Carolers; a Christmas Crafts Village which offers unique and personalized gifts; Santa’s Christmas Cabin; the “Snow and Glow” show, with nightly falling snow set to thousands of lights and Christmas music; and more. Audiences can dance and sing along to Knott’s Merry Farm’s holiday shows, like “It’s the Merriest Christmas Show Ever, Charlie Brown” at the Calico Mine Stage. 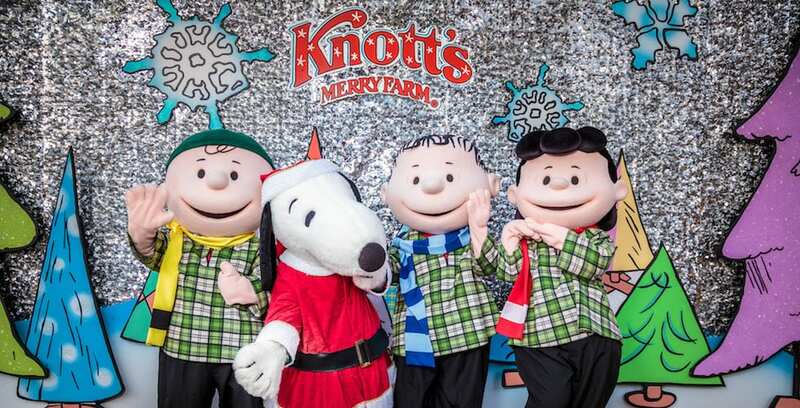 The Peanuts friends star in this merry musical on select dates during the run of Knott’s Merry Farm. The seasonal live entertainment also includes showing of the ice show “Merry Christmas Snoopy,” which also stars the Peanuts gang and a cast of world-class ice skaters. In this show, Snoopy takes in all the best parts of the season, like trimming the Christmas tree, waiting up for Santa, and attending the Christmas Ball! This show will also be performed on select dates during the Knott’s Merry Farm run at the Charles M. Schultz Theatre. New for this year, the Knott’s culinary team is introducing the Christmas Pizza, which combines all the flavors of a holiday meal into one bite. This pizza is made with soft dough and holiday toppings like sliced turkey and turkey gravy, stuffing and sweet cranberry sauce. Santa’s Christmas Cabin will open its doors to guests and offer seasonal food items, as well as a visit with Santa Claus himself. Guests can enjoy seasonal treats like freshly-baked cookies, pastries, chocolate-dipped cheesecake on a stick, seasonal craft beers, gourmet hot chocolate with marshmallows and hot spiced holiday wine, as well as new offerings like hand-made chicken and beef tamales. Families visiting Camp Snoopy can enjoy the holiday show, “A Peanuts Guide to Christmas,” performed daily at the Camp Snoopy Theater. The Peanuts offer their unique wisdom on surviving the holidays, all while singing a mashup of their favorite holiday songs. Guests can stroll through Ghost Town’s Christmas Crafts Village, which will feature dozens of local artisans selling their wares. Also in Ghost Town, Knott’s melodrama company brings to life Charles Dickens’ “A Christmas Carol” and O. Henry’s “A Gift of the Magi” at the historic Bird Cage Theatre. Performances of both shows are available on select dates from Nov. 17 through Jan. 7, 2018. The Bird Cage Theatre is also home to the comedy of “Krazy Kirk and the Hillbillies,” who continue their Knott’s Merry Farm residency on select nights. For more information on Knott’s Merry Farm’s seasonal offerings, and to purchase tickets, visit knotts.com.